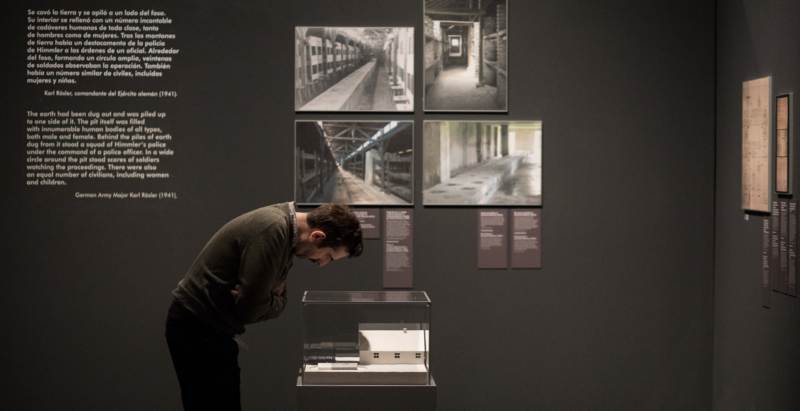 Visitor numbers for the monographic exhibition on the Auschwitz concentration camp at the Arte Canal Exhibition Centre in Madrid have passed 600,000, just a few days before the exhibition’s time in the Spanish capital is due to end on 3 February. This makes ‘Auschwitz: Not long ago, not far away’ one of the most popular exhibitions in 2018 in Spain and Europe. New objects have been added to the collection on two occasions in response to the level of interest from the public. The exhibition has seen an average of 1,500 visitors a day and peaks of up to 2,600 on weekends. Moreover, all the 100,000 free tickets for school trips made available by Canal de Isabel II and Musealia, the Spanish company behind the exhibition in partnership with the Auschwitz Birkenau State Museum, have been used. Covering some 2,500 square metres, ‘Auschwitz: Not long ago, not far away’ contains unseen photographic and audiovisual material, as well as over 600 original objects from Auschwitz. It’s the first time many are on public display following an intensive conservation process. The objects include prisoner uniforms and personal artefacts of the victims and perpetrators of the Holocaust. There are also fragments of the architecture of the camp itself, such as concrete posts, a section from the barracks and one of the original wagons used to transport over 1.3 million people to the Nazi concentration camp. Many of these objects are part of the collection of the Auschwitz Birkenau State Museum, which co-produced the exhibition together with Musealia. Musealia is custodian and manager of the remains of the Nazi concentration and extermination camp, a UNESCO World Heritage site. The exhibition is also the fruit of the collaboration of more than 20 museums, institutions and private collections, including Yad Vashem (Jerusalem), the United States Holocaust Memorial Museum (Washington) and Anne Frank House(Amsterdam). The latter has recently provided three objects related to the young Jewish girl who was a victim of the Holocaust for inclusion in the collection during its remaining time in Spain. The exhibition offers a moving and rigorous look at one of the darkest chapters in the history of humanity. It seeks to encourage reflection on the world we live in and serve as a universal warning of the dangers of hatred and intolerance. As part of Holocaust Remembrance Day, the Auschwitz exhibition cultural programme is running two activities on 23 January in remembrance of the over 6 million people murdered during Shoah, in partnership with the Sefarad-Israel Centre. At 17.00, there will be a guided tour of the exhibition for the press, narrated by Auschwitz survivor Jacobo Drachman (Lodz, Poland, 1935). At 19.00, there will be a concert in the Canal Foundation Auditorium to commemorate the victims of the Holocaust. The concert will be delivered by the pianist Pilar Angulo and the violinist Emilio Sánchez Vázquez. The programme promises a musical tour of Second World War Germany, focusing on the work of three Jewish composers who were forced to flee from the Nazis—Fritz Kreisler, Kurt Weil and Ernest Bloch—as well as the soundtrack from the film Schindler’s Listby John Williams.